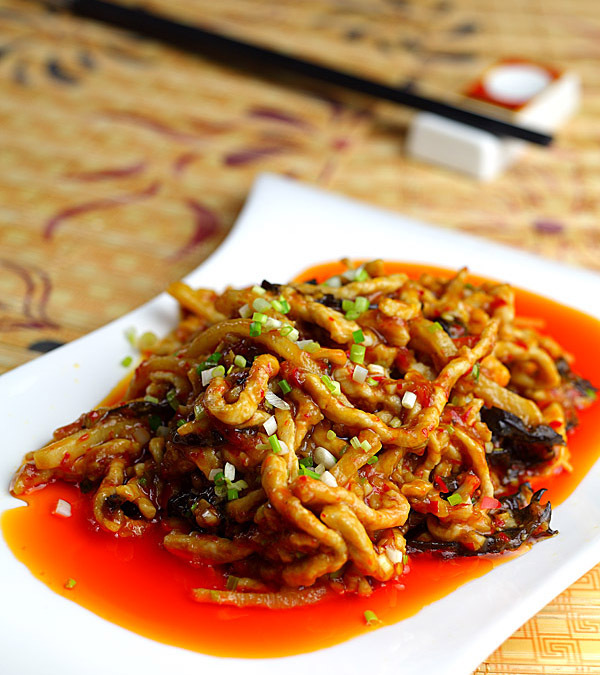 Shredded Pork with Garlic Sauce (Yu Xiang Rou Si) is a classic and traditional Chinese Sichuan cuisine. Its sweet and sour flavor and rich, spicy ginger and garlic aroma, brings back memories of family dinners. You can eat this dish in every Sichuan restaurant in China, and it’s also a favorite of many home cooking enthusiasts. It is not always made the same way, and so the flavor can vary, some being more delicious than others, of course. 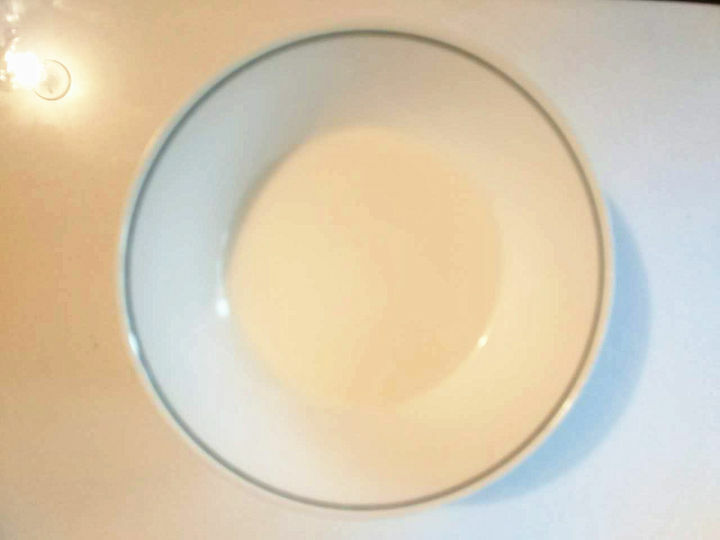 When I was a very young cook, I tried making this dish using recipes, but it didn’t work out very well. Later, I slowly began to understand that making this dish is not simple; there are many details that need attention. 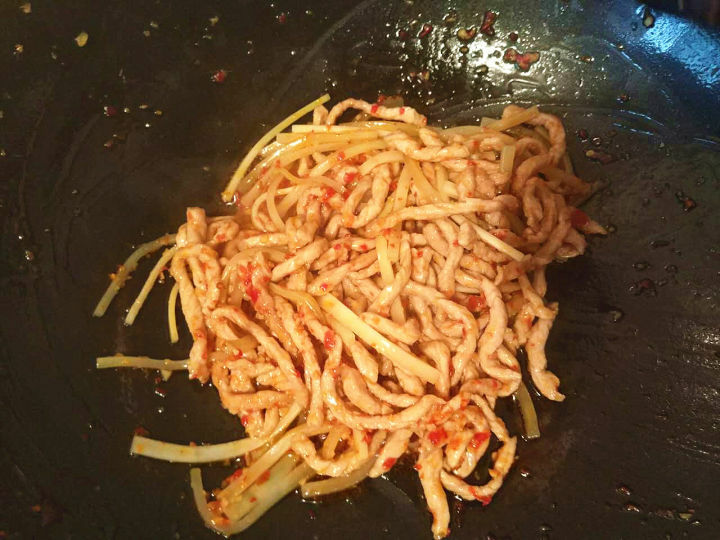 So, this time I am sharing a detailed recipe of how to make Shredded Pork with Garlic Sauce, so you can better understand the magic of this beautiful dish. 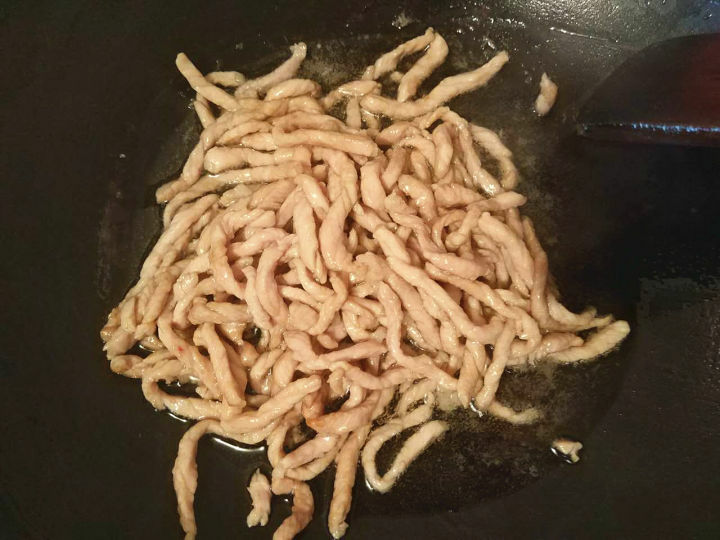 There are some important characteristics of Shredded Pork with Garlic Sauce that are important to note. 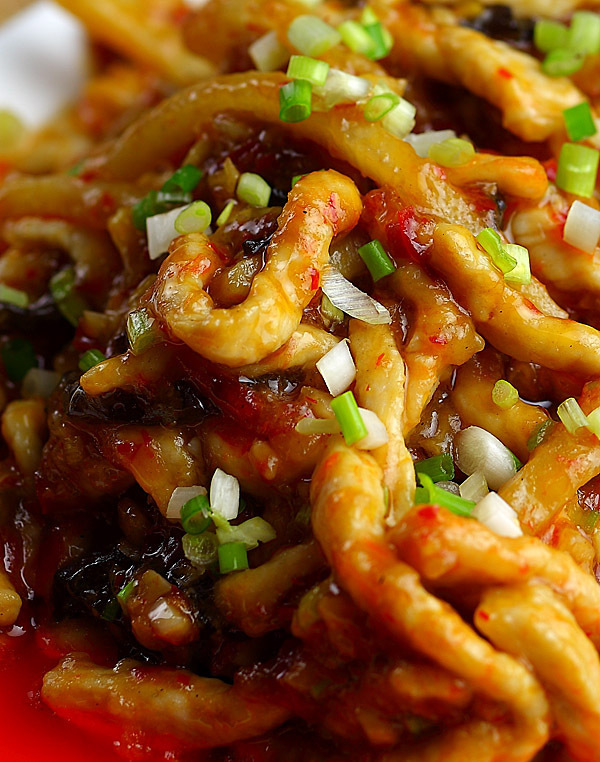 In China, Yu (鱼) means fish, but we know there is no fish in Shredded Pork with Garlic Sauce. So where does the fishy taste come from? The fishy aroma comes from the pickled peppers, green onion, ginger, garlic, sugar, salt, soy sauce etc, though it comes mainly from the hot pickled peppers. After frying the two pickled peppers, the delicious fish aroma permeates the air. Some say that the fishy flavor comes from marinating the pickled peppers with some small fish. The dish on the right is pickled peppers. The more finely they are chopped, the more flavor will come out, and it will also produce a deeper color. 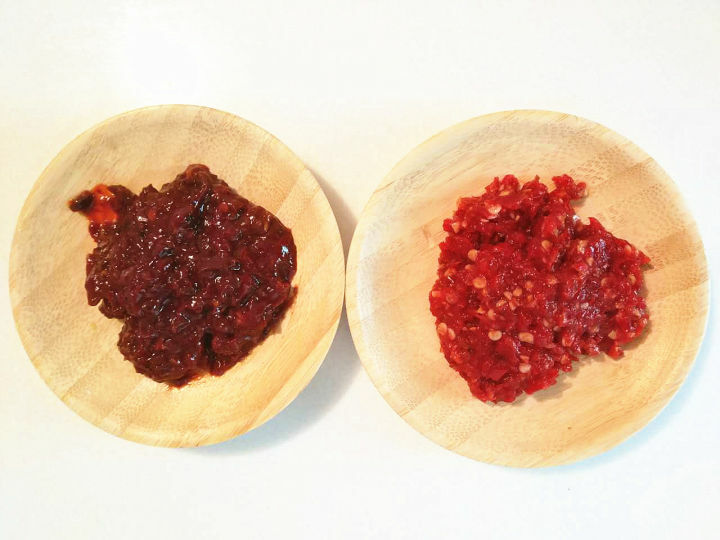 Doubanjiang or chili bean paste in English, on the left, is what you can use if you can’t buy pickled peppers. You can also use bean paste instead. (But if you can buy pickled peppers, then try to use them). 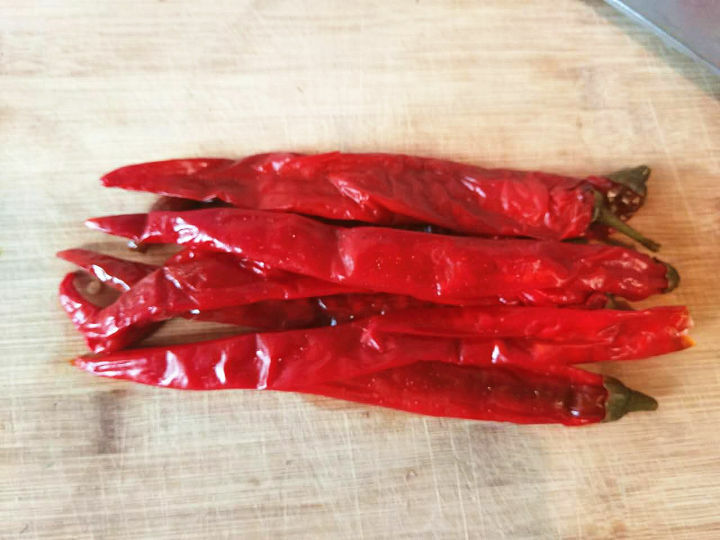 So why use Doubanjiang instead of pickled peppers? It is because they are both similar. 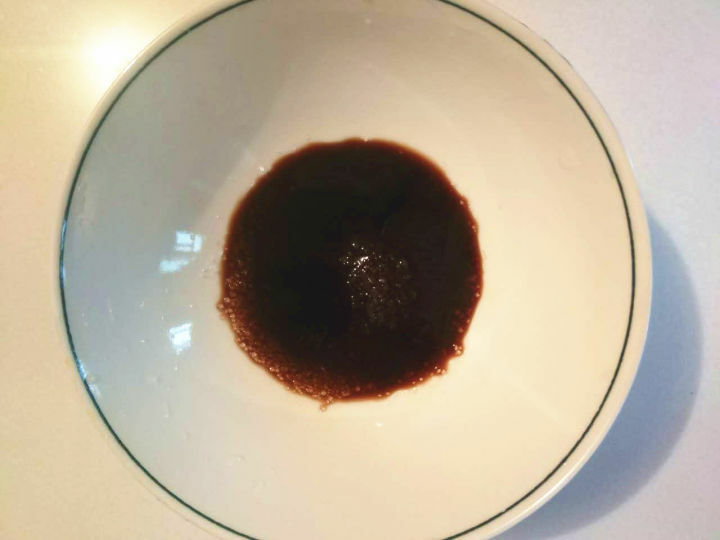 Chili bean paste is 70% pickled peppers, mixed with 30% of the fava bean. It is then fermented for six months or more. The longer they are fermented, with the addition of the fava bean, the deeper the color and the stronger the taste will be. But it still keeps the same spicy and fresh aroma as the pickled peppers, making it the go-to alternative. 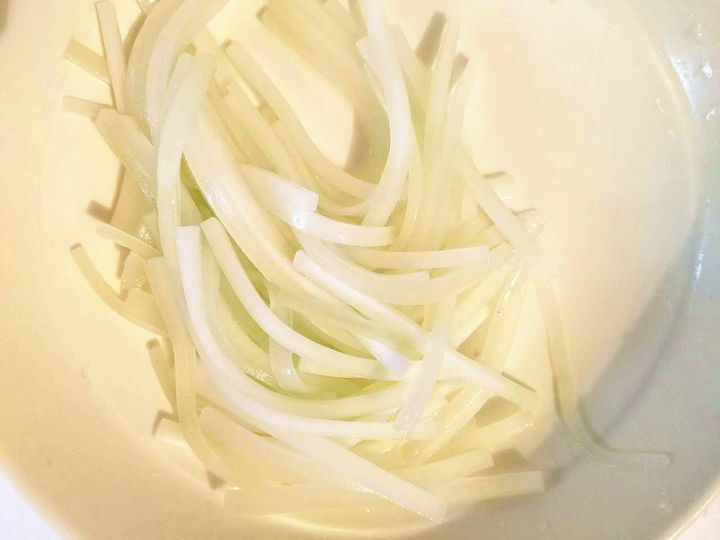 These three ingredients: green onion, ginger and garlic are vital, and for the dish to form the important fishy flavored sauce, they should be chopped very finely. There should be about the same amount of ginger and garlic, with a little more green onion. 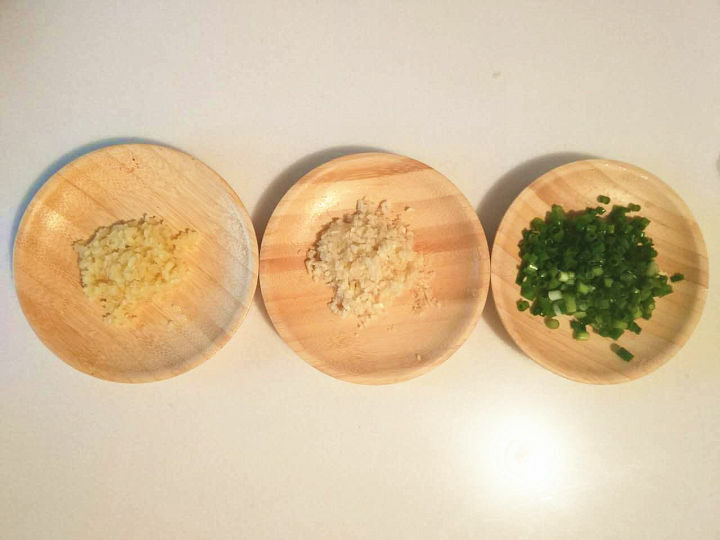 The ratio of the green onion, garlic and ginger should be 3:2:2. The reason why there is more green onion than ginger and garlic is because the onion stimulates the taste of the pickle and helps to form the strong fishy aroma. 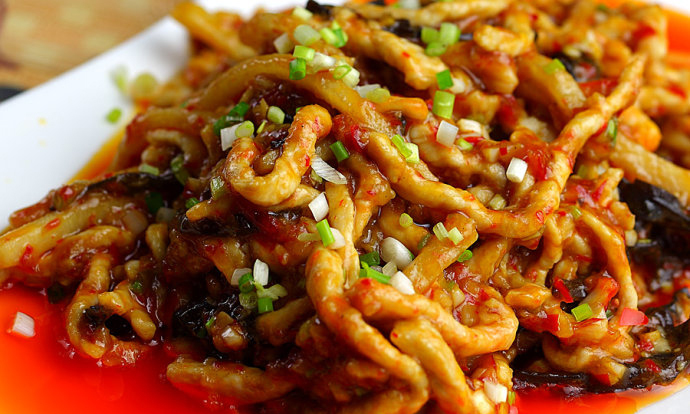 Pork Strips with Garlic Sauce will use different ingredients throughout China. Ordinary Shredded Pork with Garlic Sauce will have the winter bamboo shoots mixed with the Black Fungus. If you like, you can also mix together the green peppers, carrots and other ingredients. 150 grams pork fillet. Cut into fine strips. The most commonly used is the tenderloin because it is a nice, good cut. But the hind legs are, in fact, better. Though leg muscles have better flavor, they are not as nice a cut as the tenderloin. 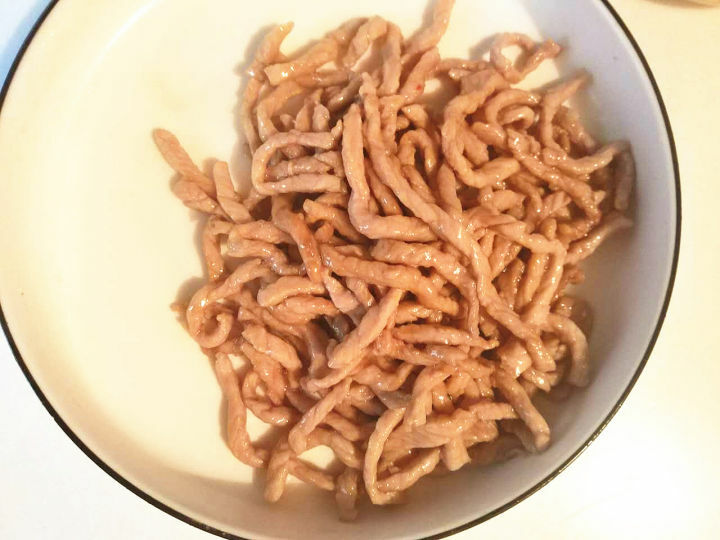 Place the shredded pork in a bowl and add the salt, cooking wine and soy sauce. 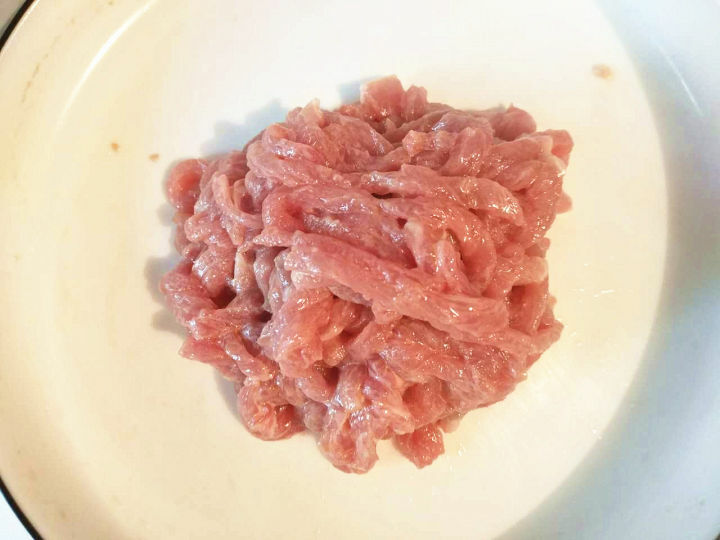 Take your time to mix everything together well, as the longer it is mixed, the better the pork will taste. Leave it to marinate for 5-10 minutes. This will add a good flavor base before you add the other ingredients. Meanwhile, place the starch into a small bowl and add the water. Mix thoroughly with chopsticks. Scoop some of this mixture onto the marinated pork and mix well, making sure that it is covered well with the starch. This layer of starch mixture will gelatinize when you fry the meat, locking in the moisture making the meat more tender. 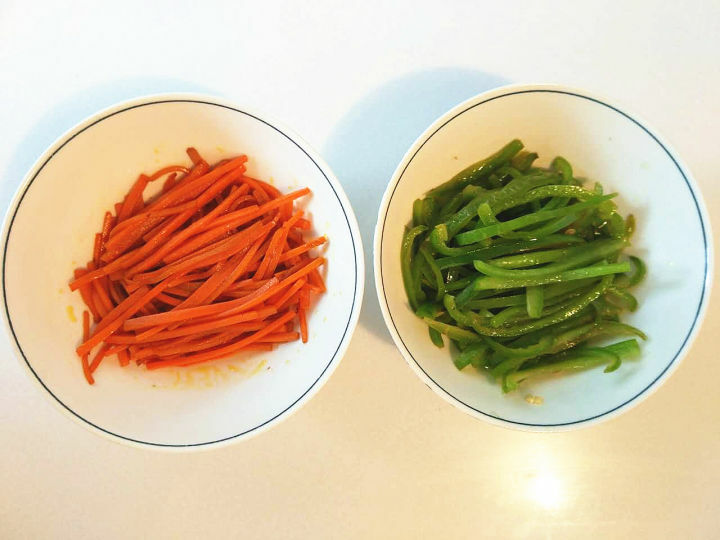 Next, cut the winter bamboo shoots, black fungus, green peppers and carrot lengthways into thin strips. Make sure the winter bamboo shoots are not watery, as this will eventually lead to the pork dish being watery. 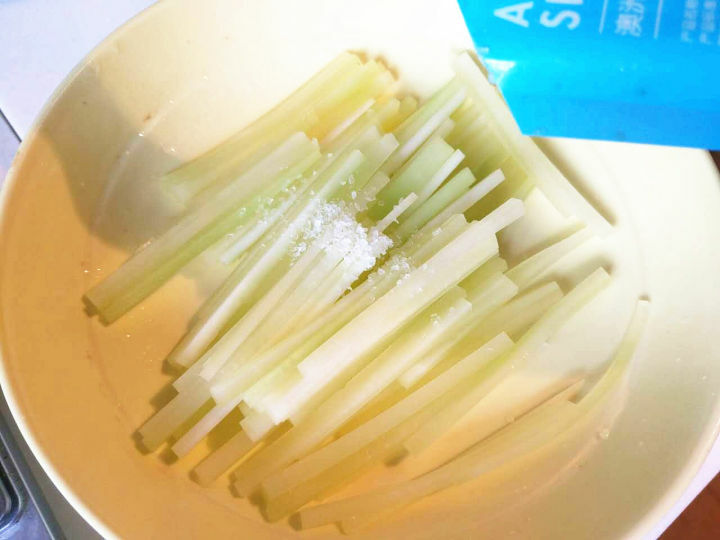 To stop this happening, let the bamboo shoots sit in some salt for 10 minutes, to extract some moisture. 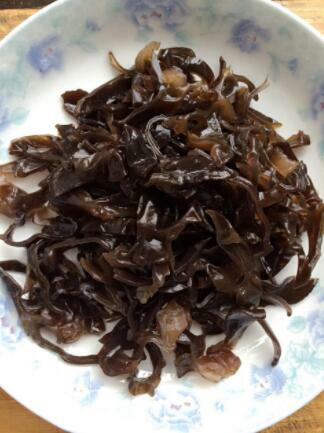 Blanch the bamboo shoots and black fungus in boiling water for about one minute and then remove. Stir-fry the green peppers in 2 tablespoons of oil in the pan for about 1 minute and then remove. Repeat the same process with the carrots, using fresh oil. The next key step – the sauce. Taking care with this step is essential in determining the final taste of this dish. 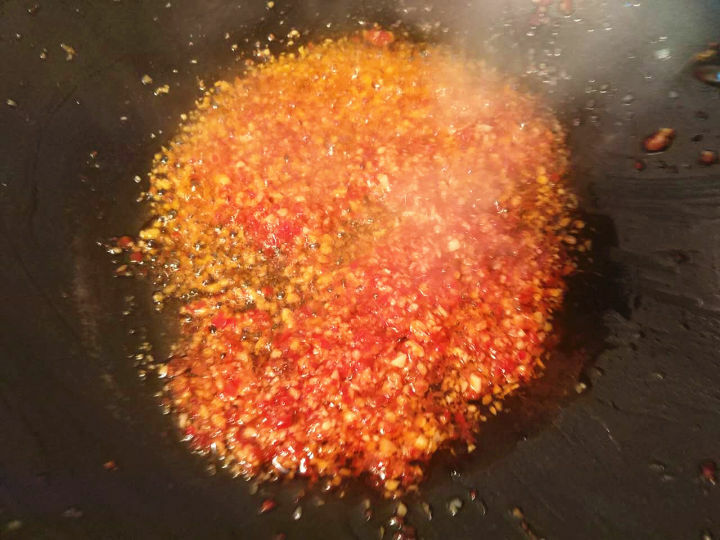 It is important to have the sauce (the main seasoning for this dish) prepared before you cook or you won’t have enough time to season while you are cooking the pork. Have the seasoning prepared for when you are ready to start cooking. 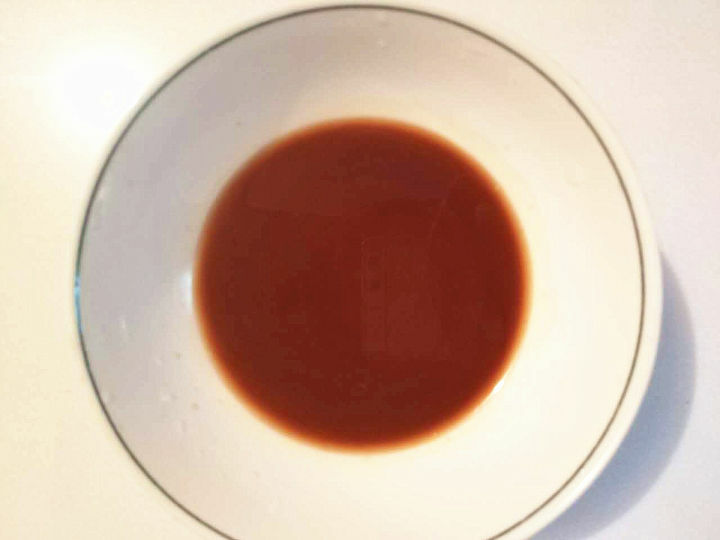 In a bowl, combine the sugar, vinegar, cooking wine, raw soy sauce and salt together. Add the starch mixture and lastly, the stock. Set aside. The combination of sugar and vinegar, are the perfect blend to add a sweet and sour taste, which is an important feature of this dish. The wine and soy sauce help add to the fragrant fishy aroma. You shouldn’t need to add extra salt because the meat has already been salted. This time, the starch mixture is not added for gelatinization, but to help thicken the sauce and make it richer. Below we will start frying the pork. 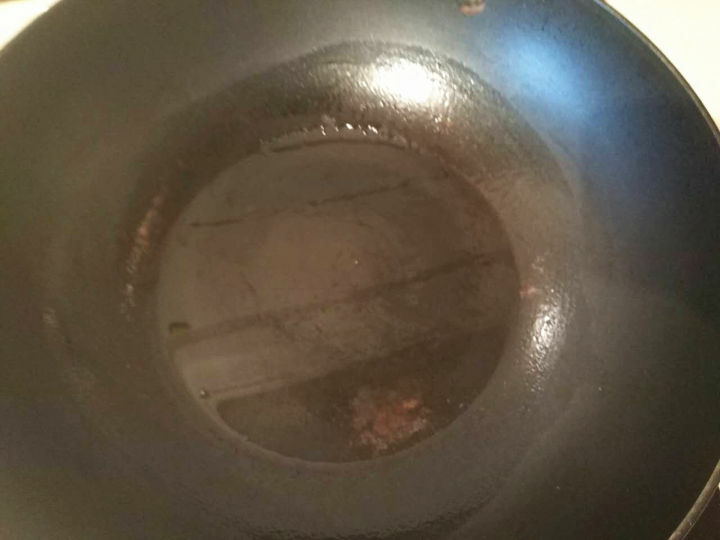 Place a pan or wok on the stove, on a high flame, and place 2 tablespoons of oil into it. Too much oil causes the meat to be too oily, and when the meat is fried, you’ll want to drain off the excess oil. If the temperature is too low, the starch will not stay on the pork, and so the pork will stick. Because the temperature is so high, the pork will begin to change color within 10 seconds. Stir for about 25 seconds (by this time it will be cooked), remove and set aside. Pour 1 tablespoon of oil into the pan. (If there is leftover oil in the pan from the pork, you will not need to add extra oil). Add the ginger, minced garlic and pickled peppers that were prepared beforehand, and cook on a low flame. If the temperature is too high, the mixture will turn into a paste. The garlic and ginger add a strong taste and the fried pickled peppers add a beautiful aroma and vivid color. At this point, you can place the pork and other prepared ingredients (green peppers, carrot, bamboo shoots and black fungus) into the pan. The sauce, prepared earlier, will be used at this point. Pour the sauce over the pork mixture into the pan and turn up the heat, stirring quickly. When the mixture has thickened, it is done. Turn off the heat and serve sprinkled with chopped green onion. A delicious Pork Strips with Garlic Sauce dish. It will have a vivid red color with a thick sauce, without being a paste. The dish will be moist, having a very smooth and tender pork flavor. It is fresh and spicy with a slightly sweet and sour taste. Be sure to prepare the sauce in advance as you will not have time to season the dish while you are cooking.